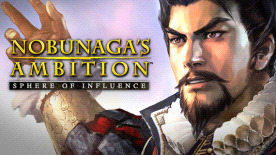 The renowned historical simulation series returns with enhanced features in "Nobunaga's Ambition: Sphere on Influence". Take the role of the legendary Warring States Daimyō (Warlords) such as "Nobunaga Oda" and "Shingen Takeda" to work your way towards unification by making best use of domestic affairs, diplomacy and battles against the fierce Warlord neighbors. The latest installment has numerous enhancements and features to it's predecessor "Nobunaga's Ambition: Souzou" by expressing the Warring era's highlight, the "Battle of Sekigahara" in the highest quality ever to date in the franchise's history. Also the numerous in game procedures required in making progress towards unification has seen a major revamp in all areas. Realistic as it gets, simultaneous strategy executions recreating a realistic battle condition. New systems are in place such as the "Alliance" command allowing you to join hands with other Warlords or "Corps under the command system" allowing you to take full control of the numerous unique Warlords under your command. 4 new scenarios tracing the historical facts are in place such as "Birth of Nobunaga" (1534), "Battle of Sekigahara" (1600) with New "Sengoku Chronicle" seeing over 500 Officers being added to the character listing. ©2013-2015 KOEI TECMO GAMES CO., LTD. All rights reserved.